Antistat supply ESD wrist straps, sole and heel grounders, ESD plugs and bonding points as well as range of grounding accessories. Call us on 512.243.5762 if you don’t see what you need, we can normally source grounding supplies within 24hrs or email us what you need to find. We are specialists in the supply and production of ESD protection. Our multi-layered, Antistatic Contamination Control Mats are suitable for clean environments up to an ISO 5 rating. Help control particle contamination by capturing debris from the soles of shoes, each mat has 30 peel-off layers, making it easy to maintain a clean, effective surface. This 3-layer smooth finish anti-static bench and floor matting provides excellent ESD protection for your workspace. Excellent lay-flat properties for quick installation, and easy to clean, this will prove to be a hard-wearing matting solution. 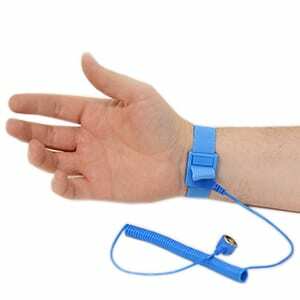 A lightweight, fully adjustable Cleanroom ESD wrist strap, comes with a 10mm press stud. Great for use within cleanroom environments. These wrist straps are particle free and easy to clean. Available to buy from stock from just $5.52 each. A high quality Coiled Earth Grounding lead/cord that provides a strong connection to ground. Suitable for use with most anti-static wrist straps, the coiled cord can be stretch and recoiled back to its original length, to help maintain clear work areas. Disposable ESD Wrist Bands are ideally suited for short term use by plant agents & visitors, field engineers and for shipping along with ESD sensitive devices, such as memory upgrades. The wrist straps are individually wrapped with instructions for use. This Earth Bonding Plug incorporates a 10mm male stud for connection with grounding wire. Available in two options designed to fit UK or European mains plug outlets as required. Order yours from stock today. This ESD bonding plug incorporates 2 x 10 mm Studs and 1 x M5 Post, designed to fit UK and Euro standard mains plug outlets. This ESD Earth Plug incorporates 2 x M5 Post, designed to fit UK and European standard mains plug outlets. With 1M ohm resistor, the plug has a metal earth pin, while the neutral and mains voltage pins are plastic. This ESD Bonding Plug incorporates 3 x 10mm male studs for connection grounding wire. Two options available, designed to fit either UK or European mains plug outlets.